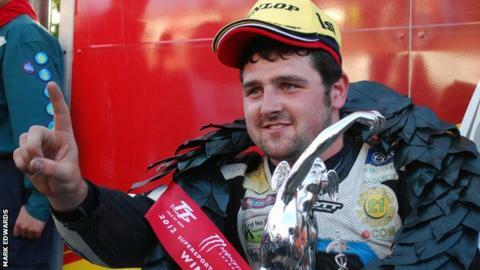 Michael Dunlop secured the third Isle of Man TT win of his career after dominating the second Supersport race on Wednesday evening. The 23-year-old Ballymoney rider finished 13 seconds ahead of Cameron Donald, who took his third second place of the week. Ryan Farquhar edged out Bruce Anstey by one hundredth of a second for the final podium place. Dunlop set the fastest lap of the race on his final circuit at 125.60mph. "I needed this win after all the disappointments I have had this week, the trouble we have been through and the amount of money we have spent," said Dunlop after winning the race on his Yamaha. "I could sense there was something wrong with the bike and I was riding within my limits," he added. Dunlop's win made up for the disappointment of his retirement in Monday's Supersport race after he had built up a 20-second lead. William Dunlop was fastest out of the blocks and enjoyed a two-second advantage over his younger brother at Glen Helen on lap one, but retired at Kirk Michael. Another of the leading contenders, Gary Johnson, only got as far as Ballaugh as he too succumbed to mechanical problems. Michael Dunlop led Donald by 7.6 seconds after lap one but the Australian rider reduced his deficit to six seconds after the second lap. Dunlop's blistering final lap proved enough to see off the challenge of the Wilson Craig Honda pilot. For Farquhar, it was his second rostrum of the week. John McGuinness, aiming for his third win of the meeting, had to settle for fifth place with Ian Hutchinson sixth. Wednesday's three-race programme had been delayed by rain and mist with the Supersport race not getting underway to 18:15 BST following the earlier TT Zero and sidecar races.